To Safely remove USB drives via a Windows 8/8.1 and Windows 10 desktop shortcut! The solution is simple to safely remove USB drives, and is also suitable for Windows Server 2016/2012, this is the Question of many Window User and hear is the answer for this very important Question for newest Microsoft's windows operating systems! Please use the Windows 8 Shortcut [Windows + D] to see the Windows-8 Desktop (see Image-1). And then, as explained in the FAQ-89: ... Windows 8 desktop shortcut create a new desktop shortcut. and as shortcut name for example Remove Hardware [see Image-1 Arrow 3]. You can also add (pin) the command Remove Hardware the Task-Bar [... see image 2 Arrow-1]. Or remove storage via Windows tray icon [... see image 3 Arrow-1,2,3]. This solution is also for Windows-Server 2016 and 2012! 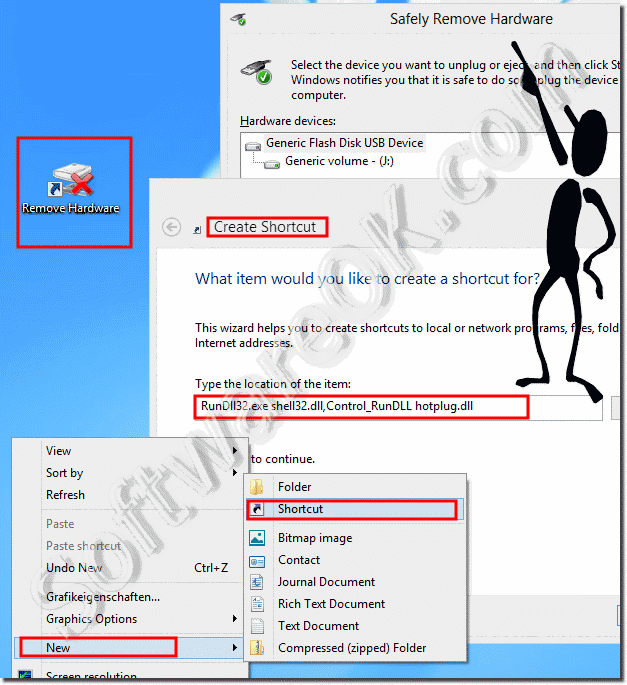 Safely remove USB drives via a Windows 8 desktop shortcut! Select the device you want to unplug or eject, and then click Stop. When Windows notifies you that it is safe to do so unplug the device from your computer. Safe removal of the USB drive is important! For some, it is believed that it is important to use the "Safely Remove Device" feature before removing flash drives from the USB port. For older operating systems, this is necessary to avoid damaging the flash memory. In fact, there is nothing wrong with disconnecting a USB drive without using the dialog box. But you should not do this during the data transfer . When removing a USB drive from the corresponding USB port of a Windows computer, it is important to understand one thing. Safely removing the USB flash drive in Windows or any other system (Linux, MAC, Android) is the standard way to shut down the USB PORT. In this case, all processes connected to the device are stopped and the power supply is interrupted. Thus, the drive can be protected from the occurrence of many problems. 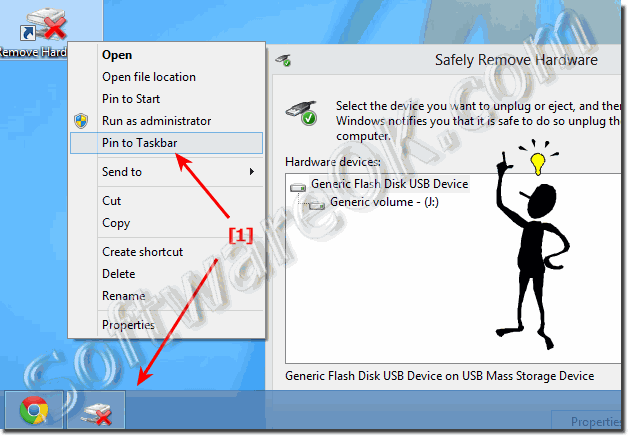 Windows-8 - FAQ-90: Safely remove USB drives via a Windows 8/8.1 or 10 desktop shortcut! In Windows 8, 8.1 or new Windows 10 you can quite easily see if you have x64 or x32/x86 Edition ergo 32-Bir or 64-Bit OS. To see this, open the Control Panel. How can I see if I have x64 Edition or Windows x32/x86 on Windows 8/8.1?